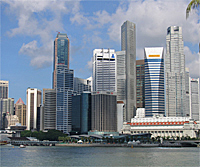 One of the world's major economic and trading hubs with over 5,000 multinational companies (MNCs), Singapore is a natural focal point for growth opportunities with its progressiveness, finesse and unique, multi-cultural Asian character. Thailand means "Land of Free" and many have described Thailand aptly as the "Land of Smiles". It is located in the heart of the Southeast Asian mainland and spans across an area of 514,000 square kilometers. With over 261 million people, Indonesia is the fourth largest country in the world. Robust macroeconomic conditions, strong domestic demand and generous raw material resources make Indonesia an economy whose prospects for growth in the coming years second to none. With close to 95 million inhabitants, Vietnam has transformed from one of the poorest countries in the world to a lower middle income country with one of the world's highest rates of urbanisation. The Philippines is an archipelago of 7,107 islands divided into three major island groups with mountain ranges, cave systems, lakes, over 15,500 km worth of beaches and UNESCO world heritage sites.